Cash For Gold Mail-In Services - Refine All Metals Ltd. Gather all your unwanted gold, silver and platinum jewellery, coins, bars and scrap, gold watches, , silver tableware and decorative items and dental gold. Sort your material by karat content into different bags and weigh it. Please do not send jewellery that is not stamped, jewellery that is known to be gold-plated, or costume jewelry. We cannot buy it, and will incur unnecessary shipping charges sending it back to you. Request a Free Gold Kit online, and we will send you the Kit to package your items and ship them to our Toronto refining facility. It takes generally three business days to receive it. We provide a padded envelope in which you can safely place your gold, silver, platinum or palladium items. Since the envelope contains the proper amount of prepaid postage, there is no cost to you to send the precious metals by mail. Insurance is also provided free of charge up to the value of $100.00.Additional insurance up to $500 can be purchased by you. Please enclose the receipt with your shipment so we can reimburse you for the additional insurance cost. You will receive a tracking number so that you will be able to find out the date on which we receive the package. Select your preferred method of payment under Payment options. Read our terms and conditions and check the box ‘I certify that I am over the age of 18 and agree to the Terms & Conditions’. Then click the Request button. Mail the return envelope with the gold content back to us and track it until it arrives to our refinery. Once we receive your gold, silver and platinum material submission by mail, prior to opening, the shipped package will be first weighed then opened and the content will be re-weighed and photographed. If there is a discrepancy between our weigh and yours, we will contact you before further processing. Upon weight confirmation, your material will be then melted into a bar and assayed to determine the metal content. We then evaluate the bar to determine their value by using the prices listed on our web site charts. On completion of the melt, we will contact you to advise you of the value and discuss the payment amount we can offer. You can either accept or decline the offer. Once we receive your gold, silver or platinum material, we take a picture of your package and its contents that will serve as a record in case there are any discrepancies between what you put in the package and what we took out of it. We then list, weigh and test your precious metal containing items in our in house assaying lab and provide you with a quote via phone or email. 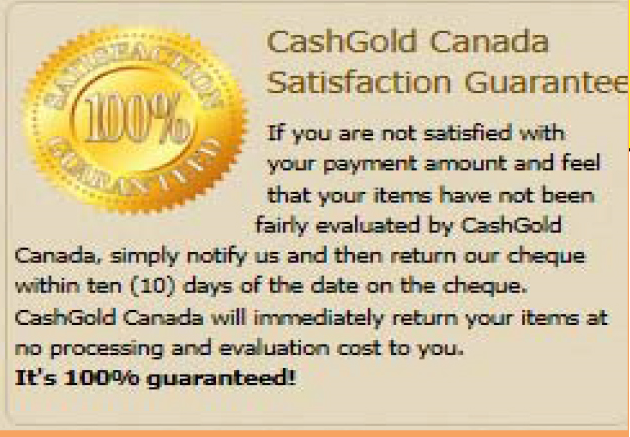 In the event you accept the offer, we will issue a cheque right away the same day or credit your account for the value of the precious metals in your bars less refining charges. We can also return the refined precious metals in commercial bullions for a modest bar charges. Payment can also be processed by bank wire or through PayPal for a modest charge. After you submit your information, you will receive an e-mail that contains the tracking number for your gold kit. Upon receipt of your items, we will send you an additional e-mail confirming the receipt of your gold kit, and after evaluating your items, we will provide you with our best offer to purchase your items. If you accept the quote, we will issue a cheque and send it to you via regular mail. In the event you decline, the material will be sent back to you at no treatment cost; however you must pay for shipping and insurance. Turnaround time is the same day as the material is received, but no later than 24HRS. Large shipments may require more time. Shipping charges will be charged to lots containing less than $100 scrap gold, scrap silver, and all bullion& coins and costume jewellery. All refiner PAKs are insured for up to $100 minimum through Canada Post. If the total value of your items is greater than $100, we recommend that you insure your package for more than $100 at your own expense. If you are using Federal Express, UPS, Brinks or postal office services, it is recommended to ship all precious metals packages registered and insured. Insurance coverage is available through most carriers. CNC will reimburse your shipping and insurance cost (coupon required) up to $100 for settlements of $5000 or more from any customer location to our facility. Click here to request your free Gold Kit. We will email you pre-paid shipping label and instructions. Depending on your location, the process generally takes three business days to receive. Material assessment and offer to purchase will be provided the same day the items are received. Payment will be issued no later than the day after you accept the offer. Insurance available up to $1000.00 to be paid by customer. Receipt must be enclosed for reimbursement by us. 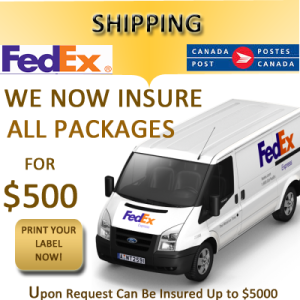 You need to get FedEx box and additional insurance if it is required. Please include the receipt in your shipment for reimbursement by CNC. Customer must get a CNC approval for any additional insurance beyond $1000. All refiner packs are insured for up to $100 minimum through Canada Post. If the total value of your items is greater than $100, we recommend that you insure your package for more than $100 at your own expense . If you are using Federal Express, UPS , Brinks or postal office services, it is recommended to ship all precious metals packages registered and insured. Insurance coverage is available through most carriers. Refine All Metals ltd. will reimburse your shipping and insurance cost (coupon required) up to $100 for settlements of $5000 or more from any customer location to our facility. Sending your Scrap has never been easier just follow the following simple steps and your package will be ready for shipping. Refine All Metals ltd. picks up the shipping tab for lots worth $5000 or more. Fill out the Refining Shipping Form including all of your contact information: Name, Address, Daytime Phone and E-mail address with your processing and return instructions. Also indicate your settlement options. Be sure to provide notice and the tracking number on packages you choose to ship and insure yourself. Be sure to fill the form completely including an accurate description of each material you are sending. Any special instructions can be filled in the comments box. Note that there are required fields indicated by a red star. For best return and better control of your shipment content, it is best to separate and list the weights of your scrap Indicating the type of material you are sending, for example, 10K, 14K, sterling silver, platinum wire and so forth. – Gold scrap-karat jewellery, scrap, and bench filings. – Silver scrap and filings. – Platinum scrap and filings. – Palladium scrap and filings. – Gold filled scrap, watch bands, and optical scrap. – Floor-sweeps, polishings, buffings, emery, and filters. * The later materials are processed separately from the readily melt-able material. Use packing materials such as bubble wrap or newspaper to prevent shifting during shipping. Affix Preprinted Shipping Labels to the box. The ship to address in the top center and the shipped from in the upper left corner just as you would with addressing a letter. No mention should be made to any form of precious metals on the outside of your shipping material. If you are using Canada or U.S Postal Service you can drop it at your nearest post office. You can also drop off material at our location at Refine All Metals Ltd, 1470 Centre Street,Unit #3 Thornhill,Ontario, L4J 3N1 by appointment only. If you are using Federal Express, UPS , Brinks or postal office services, it is recommended to ship all precious metals packages registered and insured. Insurance coverage is available through most carriers.